The first installment of Bundle Up is coming SOON. 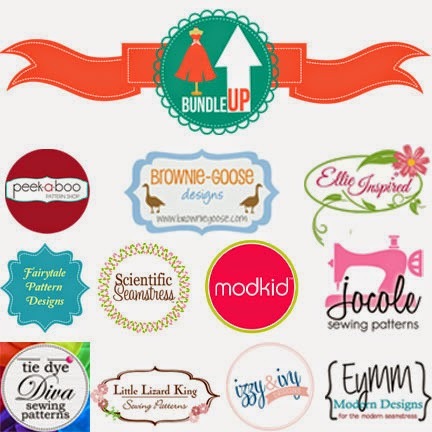 Bundle Up is a collective of your favorite established pdf sewing pattern designers coming together to offer you a sweet deal on both hot NEW patterns and favorite past releases. So what makes Bundle UP different from other bundle sales? We create themed bundles -- our first is girls (next is ladies). You get more of what you need and none of what you don't. We offer primarily new releases patterns and throw in a couple oldies but goodies to round out the bundle. We allow you to "Build a Better Bundle". You gets to pick and choose which patterns and how many to include in your bundle. Already have one of the patterns? No problem, just pick from the others. Are you ready to see who is in the first Bundle Up sale? LOVE this idea! BRING it on down!